What Are The Medicinal Uses Of Olive Leaf? Let’s face it. 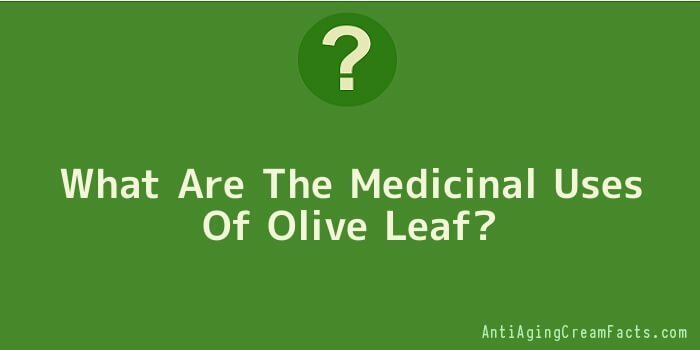 The medicinal uses for olive leaf could be numerous. Compounds found in the leaves have antioxidant, anti-inflammatory, anti-bacterial, anti-viral and anti-fungal activity. When taken orally, the extracts may help reduce blood pressure and blood glucose levels. When the oils or lipid fractions of them are applied topically, they have an anti-aging effect on the skin. So, there is the potential here for a highly beneficial ingredient. But, that all depends on the actual content of the products that you buy. Here’s an example of what I mean by that. Olive oils and extracts are often found in facial and body cleansers. Some of them are advertised as all natural, herbal or organic cleansers. But, you have to be able to read the label of ingredients to be certain about what you are getting. Recent evaluations conducted by the state of California due to information provided by the Environmental Working Group showed that several different brands of organic cleansers contained high levels of Dioxane, which, according to the state, is a cancer causing chemical. Dioxane was not and would not be listed on a label. It forms as a by-product when a petrochemical called ethylene oxide is used in the manufacturing process. According to researchers, the medicinal uses for olive leaf may include leukaemia treatment and skin cancer prevention. Obviously, those benefits would be reduced, if not completely countered, by the presence of carcinogens. Of course, skin cleansers, regardless of what they contain are not likely to protect you against skin cancer or UV damage from the sun. Anything that is rinsed off provides minimal effects, which is why there is no point in including sunscreens in cleansers. But, some companies do it anyway. Most of the medicinal uses for olive leaf extracts are dose dependent or have to do with the concentration of the lipids, if they are derived from the oils. For example, the blood pressure lowering effect requires a high daily dosage, much higher than a supplement manufacturer would recommend. Anyone that wants to take the extract for a health problem should consult with a doctor of naturopathic medicine or another practitioner trained in the use of the natural remedy. You would need a doctor to determine the correct dosage for penicillin. You need someone familiar with plant or phototherapy, to find out what dosage is effective for health problems. When it comes to prevention, the medicinal uses for olive leaf extract may include an increase in the body’s antioxidant status, whether it is taken orally or applied topically. The higher the body’s antioxidant status, the more likely it is to be able to fight off free radical damage, one of the causes of cellular aging and wrinkles. In conclusion, laboratory evaluation has shown that the antioxidant activity of the liquid extracts is double that of green tea and quadruple that of vitamin C. Most of the medicinal uses for olive leaf have to do with that antioxidant activity. Antioxidants are our body’s natural defence against aging. You can’t get too many of them.